A record number of former Hutu rebels left the Democratic Republic of the Congo (DRC) for their home in Rwanda this week, the United Nations peacekeeping operation in the vast African nation reported today. The UN mission, known by its French acronym MONUC, said that 57 former Democratic Liberation Forces of Rwanda (FDLR) fighters and 26 other ex-militiamen were repatriated from war-torn north-eastern DRC under a UN-backed scheme. MONUC also reported that more than 1,650 children had been separated from the ranks of armed groups operating in the region since the start of the year. 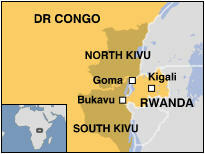 The FDLR and other Rwandan militias have been a key factor in the resurgence of violence in North Kivu province, where another 100,000 civilians have been uprooted by fighting in the past several months, in addition to the many hundreds of thousands previously displaced. In related news, the blue helmets in north-eastern DRC have established an alert and surveillance system across North Kivu in a bid to support Government forces (FARDC) against militia in the area. MONUC said its operations received a further boost this week with the opening of another joint coordination centre to help restore safety and security to the volatile region, bringing the total number to eight such centres.